Hamby Home(in)stead ...: Ice Magic! Vaughan enjoyed making frosty finger and hand prints! 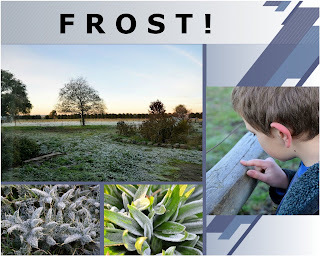 Vaughan encountered frost during our camping trip to the Warrumbungles. C-O-L-D was an oft-used expression that week - and again as winter arrived at Hamby Home(in)stead! The frost was certainly pretty - and pretty novel! Vaughan and I had fun crunching across the paddocks admiring all the icy leaves, rocks, posts, fences and cow-pats! Our cars were often ice-covered. Some mornings warm water was necessary to clear the windows before the 8:45am school-run!